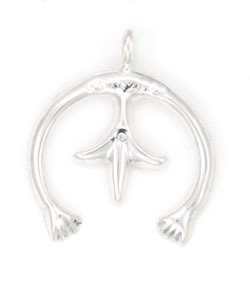 Sterling silver cast naja pendant. Measures approximately 1 1/4" long including bail by 1 1/8" wide. It has little stamping on the top part of the naja. Crafted by Navajo artisan Francis Begay or his grandson Nataniel Spencer. Stamping may vary.